It is hard to imagine the valleys of western Tibet. 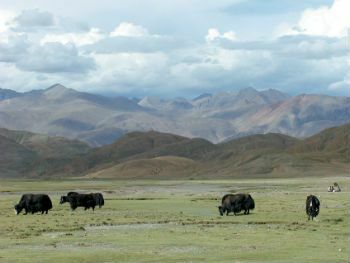 Edged by towering mountains on every side, these lands are home to ranging herds of yak and flocks of sheep as well as to the nomadic families who tend them. Undomesticated animals also share the valley terrain. Antelope, goats, a burly marmot (obsessed with digging holes), and tiny rodents scurrying from place to place appear abruptly and as suddenly disappear. Crows and other birds have a presence there as well, and there are fish in the near-icy streams that cross the valley floors. Well above the tree line, and too high to grow tsampa (the native barley that serves as a dietary staple), the earth’s surface in these valleys is dotted with tufts of grass, low-growing juniper bushes, and sprigs of straw. Dust and dirt fill in the spaces between. But in some valleys desert sand creeps from the mountain edges, and high dunes rise up across one’s path. It is not uncommon to find that in a nearby valley, seemingly like the sand-filled one, the relentless wind and arid conditions moderate. There the land’s surface blossoms with small flowers, and enough grass germinates to support animals whose existence depends upon good grazing. It is the remoteness of these valleys that is difficult to describe. For some perspective, consider that the tip of Mount Whitney (the highest point in the continental United States at 14,494 feet) is as much as 1,000 feet lower than the valley floors spreading across the 900 miles from Lhasa in south-central Tibet to Lake Manasorovar and Mount Kailash in the west. It is the remoteness of these valleys that is difficult to describe. Even with Land Rovers, crossing these valleys is a slow process. For the most part, the group of 35 I was with this past June managed it quietly. We were on a pilgrimage, a trip to Mount Kailash, a mountain which, like Mounts Olympus, Fuji, and Sinai, has attracted visitors for thousands of years. The mystique and lore surrounding this mountain had captured our minds and imaginations well before we left the States, and many of us had read books or talked with others who had made the trip before. But as we inched along uncertain roads, it was impossible not to also speculate about what it would be like to live in these valleys—and to wonder if life in them held secrets we might uncover just by looking on. Our romantic notions were quickly put aside. Shangri-la was a literary invention of 1932, never a physical locale in these parts. Here, despite an occasional satellite dish or solar panel, poverty and hunger remain painfully real. 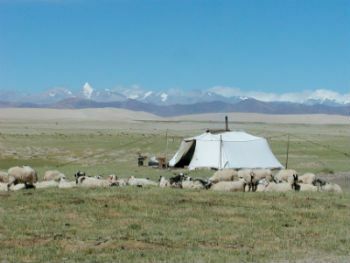 We seldom stopped for a Sherpa-prepared meal without attracting a small gathering of hungry onlookers from the nomadic camps in the valleys. But whatever we could share was only enough to create a brief interlude in the day’s routine for both the visitors and for us. Nomadic life was not much changed by our comings and goings; whenever we returned to our vehicles to continue on, we were inevitably thrown back into our own thoughts, which centered around the pilgrimage itself. What we were really sharing with those who lived here was far more than a bit of food or a stretch of road. In the rarefied space of this land, without most signs of civilization and missing even the varied plant life we were accustomed to seeing at lower altitudes, the giant features of the earth and sky themselves came to life. It was the wonder of expansive lakes, foothills rolling into the distance, sky-piercing mountains, and the deep blue skyvault above that filled our minds. Our final destination, Mount Kailash, would appear after five days on the road. It is a powerful place—venerated with such intensity that no one to this day has been permitted to climb its peak. And it is so revered that any attempt to climb it would be seen as a desecration. Instead, pilgrims walk around it, viewing the mountain’s features from a rough trail that can only be completed by foot. From this vantage point they see in the mountain’s stone and snow-covered surfaces images they associate with primordial beings and times. For example, Hindus honor Mount Kailash as the earthly home of Shiva and his wife, Parvati. Among hundreds (perhaps thousands) of shapes they see on the western face of the mountain is the image of Shiva embracing a pyramidal cone of snow that symbolizes his divine consort. For Buddhists the stone surfaces of the entire region are associated with the Buddha. In the eastern valley, for example, is the Palace of the Medicine Buddha, a mountain associated with the Buddha of healing. The more ancient Tibetan faith, the Bon religion, recognizes Mount Kailash as a center of power and claims that circumambulation around it will achieve life’s aims. But what would Western-born students of yoga find in this mountain? How is Mount Kailash a place of yogic significance? And would we, in some way, recognize it if it were? These questions were on the minds of most of us as we made our way through the passes that led from one valley to the next. Along the way we had begun to notice some Tibetan spiritual practices that helped answer our questions. Throughout Tibet we’d seen people turning prayer wheels, cylinders inscribed with mantras on their outer surface and containing written mantras on the inside as well. These prayer wheels are mounted on shafts and often placed along the walls of monasteries and stupas so that passersby can rotate the wheels with one hand. We would also see Tibetans walking about rotating handheld prayer wheels. Their right hand held the top of a two-foot shaft connected to the wheel, while the bottom of the shaft rested like a flagpole in their belt. The movement in their body kept the top portion of the shaft in constant motion, and this in turn revolved a small weight that was attached to the prayer wheel by a chain—thus turning the wheel itself. Some handheld wheels were rotated continuously, even while those who turned the wheel were having a conversation. Turning these wheels is a physical effort to remember and venerate the mantras connected with them. It is also a kind of tapas, an act of devotional self-discipline. The exertion of holding and revolving the wheel is no small thing. 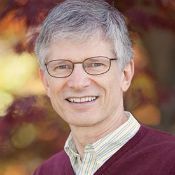 It is a dramatic reminder that mindfulness—remembering one’s inner center while engaging in outer activity—is a commitment from every aspect of one’s being. Cultural differences made it unlikely that any in our group would seriously embrace the custom of turning prayer wheels. Nonetheless, we drew subtle inspiration from those who did as we began our parikrama (circumambulation) on foot, for there was a correlation between turning a prayer wheel and our own journey. Just as the shaft of the prayer wheel is its geometric center, so has the gigantic pillar of Mount Kailash been described as the hub for an imaginary wheel of enormous proportion—a wheel of life. Our circumambulation of Mount Kailash was, in effect, the revolution of 35 individual spokes in that immense wheel—a personal turning of a wheel whose center was a mountain. We traveled clockwise, the mountain constantly on our right. Its presence was a pervasive energy, an enormous figure of stone revealing itself in new ways with each step. And even when the mountain was concealed by foothills or by the steep valley walls, it remained a lingering reality in the mind. Whatever one’s purpose for coming, whatever one’s mantra, it threaded its way into life on the mountain, at times almost completely suffusing the space of the mind with its presence. Like turning a prayer wheel, our circumambulation prompted a mindful quietness and contemplation. Mind and senses were constantly delighted by colossal forms—rock and snow mounting upward, linking earth and sky. At the same time, however, a powerful sentiment that reflected the extreme remoteness of this place turned the attention inward and transfixed it there. Whatever one’s purpose for coming, whatever one’s mantra, it threaded its way into life on the mountain, at times almost completely suffusing the space of the mind with its presence. There were signs that others had also been profoundly touched by this place. Cairns, mounds of rocks and stones built with human hands, dotted the entire route—the perfect and natural response to the mountain and its landscape. The stones were woven into the surface of the soil like countless beads on a broad piece of cloth. Why not gather a few together, they seemed to say, to echo on a human scale what the universe had created on an infinitely grander stage? 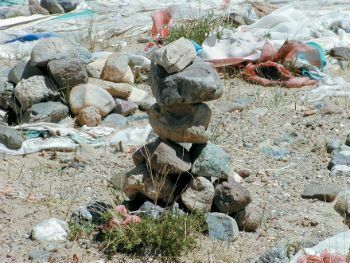 Many of the cairns included flat-surfaced stones on which mantras had been chiseled. Like offerings made to space, they lay under the open sky, gradually increasing in size with the arrival of successive groups of travelers whose devotion (or need) pressed them to add more stones to the existing pile. At 18,600 feet the climb to the highest pass on our route, Dolma La, became a strenuous test of endurance. Here, much of the vegetation of the valleys had been left behind, and only various kinds of lichen and very small ground plants remained as signs of life. The dramatic reduction of oxygen content in the air had its effect on our respiratory systems, accustomed to a much richer blend of fuel. Weary legs and lungs carried us along, but tired quickly. To complicate matters, boulder fields on either side of the pass required us to travel a winding route up and down—and at times those boulders provided only the merest indication of a path. As we approached the pass, determined to make it up the last steps, a strange sight came into view: a literal field of brilliant prayer flags—attached to one another, attached to rocks, attached to anything—flying in all directions, virtually littering a huge area at the highest reaches of the path. At the peak was a boulder about the size of a small bedroom. It too was covered with fluttering flags, and in this bleak and colorless world, their dazzling primary colors flashed in the sunlight. We had not yet seen a field of flags quite like this one, but we knew from earlier experience that it represented more than religious decorative art. Mantras and blessings were written on the colorful pieces of cloth, and it was said that the constant mountain winds carried them out into the breeze and down to the valleys and plains below. Every high pass and peak was marked by at least a small collection of such flags—and each sent its blessings down from the heights. The instinct to leave a prayer flag at Dolma La satisfied a deep desire to show love for those who were not present. Some of our group had even brought flags of their own, bought in the markets of central Lhasa, to add to the collection here. Present yet not present. Unseen yet remembered. Above yet below. The yogic ideal of nonattachment revealed itself at Dolma La as an experience of love-in-separation. Looking out from this high pass made one aware of the inevitable separateness of one person from another. And the exertion required to reach the pass only amplified the feeling of remoteness. But a deeper lesson seemed also to emerge. It was that love conquers separation without disturbing it. In love, the natural separations of life are transcended by a union of spirit, and the dancing flags, their blessings blowing out into the wind, gave colorful form to that truth. 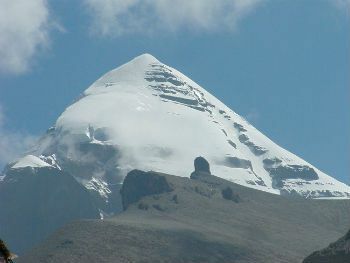 It is difficult to say whether Mount Kailash really is different from other mountains on the earth. Certainly the lore and religious customs that surround it influence the thoughts and feelings of anyone making the journey there. Yet the mountain is more than a simple embodiment of the stories about it. It is an archetypal presence of stone, and for those with a yogic background, a ready receptacle for spiritual imagination of the best sort. In the mountain, mind and matter coalesce on a mammoth scale, and the result is a perpetual feeling of delight and awe. The journey down was both a sad departure and a reassuring return to the familiar. Within days we were descending through valleys filled with dense forest, fields of barley and mustard, and ribbons of water falling from steep valley rims. Our experience of Mount Kailash rising above the world was dimmed by the new realities before us. Soon we would be testing our wits in the urban centers of Kathmandu and New Delhi. But our pilgrimage has had a lasting and satisfying effect. Throughout the days since, it has proved possible, with our eyes closed, to feel again the presence that perpetually is—on the high ground of Mount Kailash.